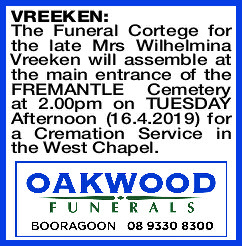 The Funeral Cortege for the late Mrs Wilhelmina Vreeken will assemble at the main entrance of the FREMANTLE Cemetery at 2.00pm on TUESDAY Afternoon (16.4.2019) for a Cremation Service in the West Chapel. 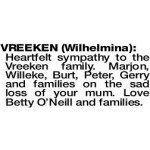 Deepest sympathy to Willeke and family on the sad passing of your precious mum. Thinking of you all at this very hard time. 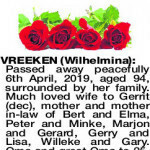 VREEKEN WILHELMINA Passed away peacefully 6th April, 2019, aged 94, surrounded by her family. Much loved wife to Gerrit (dec), mother and mother in-law of Bert and Elma, Peter and Minke, Marjon and Gerard, Gerry and Lisa, Willeke and Gary. Oma and great Oma to 25. A special thanks to the staff at Coolibah Nursing Home for their care of Mum. 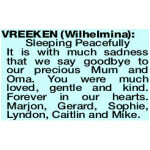 VREEKEN WILHELMINA Sleeping Peacefully It is with much sadness that we say goodbye to our precious Mum and Oma. You were much loved, gentle and kind. Forever in our hearts. Marjon, Gerard, Sophie, Lyndon, Caitlin and Mike. To my beautiful mum, may you now rest peacefully in the arms of dad. 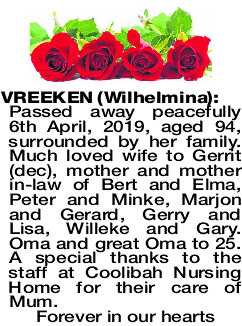 VREEKEN WILHELMINA Heartfelt sympathy to the Vreeken family. 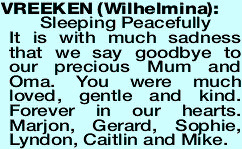 Marjon, Willeke, Burt, Peter, Gerry and families on the sad loss of your mum. Love Betty O'Neill and families.